I never thought he’d be chasing me, or that I’d be chased by anyone (or by a dead guy), for that matter, but this is just too much to pass up writing about. I’m serious. I’m beginning to believe I can’t escape Anton Chekhov. 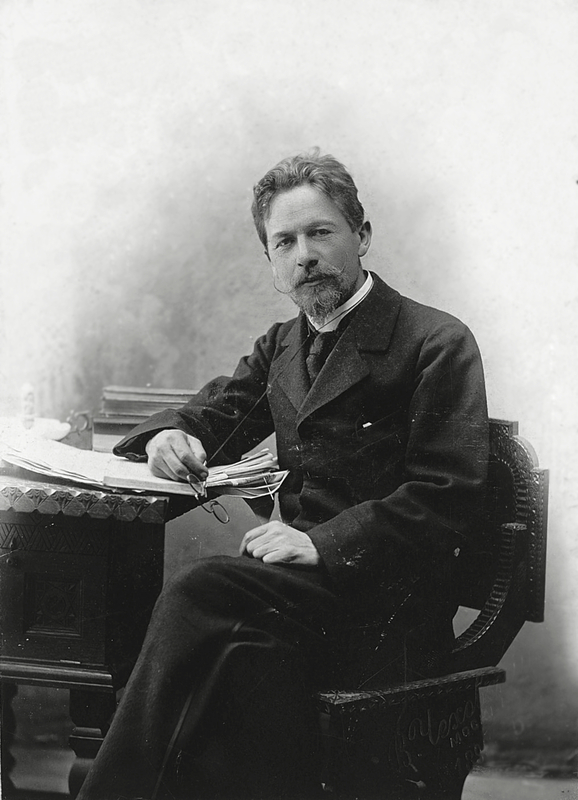 For those of you who don’t know, Anton Chekhov was a Russian physician, dramaturge, and short story writer. A very good short story writer, apparently. His name hasn’t been erased from history yet. At first, I didn’t think too much of him. The earliest I remember hearing about Anton Chekhov was in my Intermediate Fiction class last school year. My teacher had mentioned “Chekhov’s gun.” Supposedly, if there was a gun planted in any of Chekhov’s stories, it was expected to go off. In other words, a writer is supposed to use the elements of their story to create suspense and add meaning to their work. Keep tapping at that gun or that flower that your mind brought up in the draft; there might be something there that ties back to the theme. Fast forward to this summer, and I’m reading more on writing. I bought four books on writing, and have read through three of them thus far. Just recently I finished the Writing Active Setting series by Mary Buckham. Don’t tell me the moon is shining; show me the glint of light on the broken glass. This is a very apt quote for her to bring up in her discussion of setting. Much of where setting can fall short is in the telling of a setting rather than the showing of a setting, or as I now prefer to call it, the informing rather than the evoking. I thought Chekhov was on to something. I Googled him, learned a little bit more about him, and then decided to crack open my next book on writing, the one I’m currently reading: Mastering the Craft of Writing by Stephen Wilbers. And on the third section, “Appeal to the Senses,” guess what and who Wilbers quotes? With that same quote about the moonlight. Two different authors quoting this guy. Two with the same quote. This is when I realize it goes much deeper than I thought. That’s three out of the four writing books that I purchased with authors that quoted Chekhov in some way! Thank goodness the fourth one doesn’t, or otherwise, I’d go really berserk. Now granted, two of the authors, McClanahan and Wilbers, have published their books via Writer’s Digest. I expect some overlap. But to have Buckham, who is not associated with Writer’s Digest, quote him, too? And all happen to be books that I pick up at once? What are the odds of that? How many writers are disciples of Chekhov? How many authors know they’re quoting him like crazy? How many books will I read in my lifetime that keep quoting Chekhov? And how long will it be before I teach writing and start quoting Chekhov myself?! Sigh, okay. I like Chekhov. He comes off as a smart writer who brought a lot to writing. But now I worry he’s everywhere. In the short story writing community. In my classroom. In my writing books. Now I wonder when I’ll encounter him next—in an essay I have to read for class? In yet another writing book I happen to pick up by chance? Or is he already in the books that I own that I have not yet read? Forget Chekhov’s gun. Try Chekhov’s ghost. What of you, dear readers? Anybody that keeps showing up and haunting you as you read?